This study describes the effects of prominence and boundary marking on the temporal and melodic structures of two regional languages of Indonesia, viz. Toba Batak, a stress language, and the author’s native language Betawi Malay, a non-stress language. Experimental evidence shows that, unexpectedly, lengthening effects were more than twice as strong in the non-stress Betawi Malay as in Toba Batak. 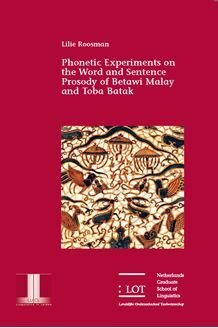 Durational prominence effects in the stress language Toba Batak are compa­rable to those found in western stress languages at the word level, but not at lower levels: stressed syllables, especially consonants, are hardly affected. The author argues that the use of duration as a stress correlate is restricted by the phonemic consonant contrast in the language. Arguably, to compensate for this, prominence-related pitch movements, which are tightly connected to the stressed syllable, occur in non-prominent as well as prominent words in Toba Batak, whereas in western stress languages such movements only occur in prominent words. In non-stress Betawi Malay prominence-related pitch move­ments are larger but vary considerably in shape and position; they serve to cue accents and boundaries, but not stress position. To determine the audible consequences of the native language for the produc­tion of Dutch stress, three perception experiments were run. The native lan­guage clearly affects the prosody of second-language speech. Toba Batak speakers of Dutch sound more acceptable to Dutch listeners than Betawi Malay speakers do. This book is of special interest to experimental linguists working on stress and intonation and to linguists working in the field of second-language acquisi­tion.